On Sunday, September 4, 2005, Rev. Tony Ponticello addressed the congregation at the Community Miracles Center in San Francisco, CA. Six days prior, on August 29th, hurricane Katrina had hit the city of New Orleans in the early morning. What follows is a lightly edited transcription of that lecture. Everybody knows what the news has been about this past week, Hurricane Katrina. 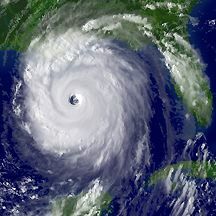 Hurricane Katrina turned into a category five hurricane just before it hit the New Orleans, Louisiana / Biloxi, Mississippi area. If you are not familiar with categories of hurricanes – category one is when they have between 74 and 95 miles per hour winds. Category two is when they get between 96 to 110 miles per hour winds. Category three, which is considered “strong”, is when they get to 111 to 130 miles per hour winds. Category four, considered “very strong”, is when they get between 131 to 155 miles per hour winds. When they cross over past 155 miles per hour winds they go to category five and they are called “devastating” hurricanes. That’s what hit New Orleans, a devastating hurricane, as we can see. Frequently we call these things, “natural disasters.” Insurance companies like to call these things, “acts of God.” (laughter) We in A Course In Miracles get to challenge this thinking as the reading for today said. There’s nothing natural about it. It’s an “unnatural disaster” because all disaster is indeed unnatural. It’s unnatural that the Holy Child of God be somehow victim to these events we call disasters. This is challenging even to A Course In Miracles students. Somehow we hold nature apart from it all. There is some sort of sanctity about nature. Nature is – God, “Right?” – in expression in this world? But, I will pose that there is actually nothing natural about nature at all. The Course wants us to challenge our ideas about nature. A Course In Miracles says, “This particularly unfortunate interpretation, which arose out of projection, has led many people to be bitterly afraid of God.” (T-3.I.1.6) When we interpret God in this way we become bitterly afraid of Him / Her and the Course is asking us to do something different. Since I like to put a positive spin on everything – it just feels better – people asked me what positive spin could I put on this event, this hurricane that hit New Orleans so terribly. What I see that looks like a good thing – thank God, it woke us all up and really brought to our minds that terrorism is not the only problem that we face in this world. I’m so sick of that. I’m so sick of this focus, this fascination – we’re so fascinated about terrorism. Think about it. We’re spinning round and round with this idea that terrorism is our big problem and if we could only defend ourselves against terrorism then we would have all our problems solved. The government has been absolutely focused on it and fascinated with it. So much so, that it took them a long time to respond to Hurricane Katrina. Hurricanes weren’t the problem; terrorism was the problem. They had to shift gears. That’s what happens when you tightly focus and spin round and round. When you have to move somewhere else you get dizzy and confused. They were standing in the “eye” of a Hurricane of terrorism. They weren’t able to see outside of the “wall” of that. The defenses, all the things that we’ve done to defend ourselves, are actually just bringing the problem back to us. They don’t solve anything. I thought about this last week. It came home to me personally. My sister visited me this past week. She hasn’t visited me since 2002. So, it’s a big deal that she visited. She was only here for four days. She came on a Monday night and flew back early on the next Friday morning. So, I was in the airport twice, once to pick her up and once to bring her back. I’ve noticed something about the airport. Maybe you’ve seen it too. About a year ago I noticed this. I thought that they were doing construction in the airport parking garage because they had blocked off a large portion of the parking garage. Now, I’ve gone back, many times, and I see that a large portion of the parking garage is still blocked off. You know what, I don’t see any construction taking place. Now I realize that it’s blocked off on every floor. All the area at the outer circumference of the parking garage, the large area, the area that’s next to the terminal, they don’t let us park there anymore. Then I got it. It has nothing to do with construction; it’s an anti-terrorism thing. They don’t want terrorists parking bomb filled trucks and cars there because if they went off there, they would be next to the terminal. So what they have done is eliminated about 35% to 40% of the parking in the parking garage. They have also had to reroute the traffic lanes, because that was how you used to get around, by driving to the outer circumference of the garage. They complicated the routes through the parking garage and there’s not as much parking. (pause) And I feel so much safer now that they have done this. (laughter) I can sleep at night now. Oh yeah! Also, they’ve done other things there. We always had security check points that ticketed passengers had to go through but they have now moved them forward. I don’t know if you’ve noticed this, but they’re not where they used to be anymore, which were before the entrances to the gates. Now the security check points are right up next to the entrances to the terminal itself. Which means, when I brought my sister back to the airport, early in the morning, our intent was to get there and find a little place where we could have breakfast. But there’s no place you can have breakfast anymore because they’ve moved the security check points up in front of all the restaurants, even the ones that were formerly in front of the gate entrances. Now, when you come in all you can go to is the ticketing desks and the security check points and that’s it. I didn’t get to have breakfast with my sister! And again, I felt so much safer. (laughter) We just do all these defense things. It’s a hurricane of defense! It spins round and round faster and faster! What more can we do! What more can we do! I think we forgot, that the terrorists on 9/11 – they all had tickets! (laughter) None of them had weapons that would have been detected by the metal detectors. None of this would have stopped any of them! But we just keep doing more of it. It doesn’t make any sense. It’s an insanity. It’s just like A Course In Miracles says it is. A Course In Miracles tells us we always want to find the villain. We always want to see the problem out there. Who’s my enemy? “A brother separated from yourself, an ancient enemy, a murderer who stalks you in the night and plots your death ... of this you dream. ... Here is the cause of suffering, the space between your little dreams and your reality. The little gap you do not even see, the birthplace of illusions and of fear, the time of terror and of ancient hate, the instant of disaster, all are here. Here is the cause of unreality. And it is here that it will be undone. (T-27.VII.12.1.2-6) “ are the dreamer of the world of dreams. No other cause it has, nor ever will. Nothing more fearful than an idle dream has terrified God's Son, and made him think that he has lost his innocence, denied his Father, and made war upon himself. (T-27.VII.13.1-3)” It’s our dream. The hurricane showed up in our dream. The terrorist attack of 9/11 showed up in our dream, the dream we’re having. The war in Iraq, it’s in our dream. We are at cause. We are the dreamer of the dream. It doesn’t exist out there. It’s not nature. President George Bush isn’t the problem. We’re the problem. And, we’re also the solution! Thank God! We have the means to correct all of it. I think it’s great that the idea – terrorism is our main problem – has been broken up. Terrorism is not our one big problem. Wait a minute. There are dangers in every corner. We rush around saying, “Who’s guilty? Who’s guilty? Somebody’s got to be guilty.” George Bush is guilty. He didn’t respond fast enough. And, he’s probably a racist because the people who suffering were mostly black. People aren’t very happy with George Bush lately. His approval rating is at an all time low and I have those thoughts as well. But, I do have to do what A Course In Miracles tells me to do. I have to think, no one is really guilty. We make mistakes in our thinking and it’s causing a dream in which terrible things appear to happen. But the mistakes are in our own minds. We can correct them and we can dream a dream that’s different. New Orleans, let’s talk about New Orleans for a minute. One thing, it’s a beloved city. It’s beloved by countless millions, because countless millions have gone there and partied there. I went there about four years ago with a friend and partied there. It’s got a Caribbean energy. There’s a lot of drinking that goes on there and wild partying. It was formed in 1718 as a French Canadian outpost. It’s been held by both the French and the Spanish. So there’s French and Spanish influences there. The French Canadian / European influence has evolved into what we call the Creole aspect of New Orleans. When this French Canadian / European, Creole culture mixed with the African American and the American Indian people, it evolved into what we call the Cajun culture. They even speak a strange form of French mixed with other dialects which we call the Creole language. There’s the Creole and the multi-cultural Cajun thing going on in New Orleans. So it’s very diverse and quite unique culturally. If you’ve ever been there then you know what I’m talking about. It’s always been a major sea port. Maybe you don’t know, but New Orleans is the largest, most active sea port in the United States in terms of tonnage shipped. And it’s the forth largest in the world! Only Singapore, Rotterdam and Shanghai move more cargo than New Orleans. Since it’s such a huge sea port it’s been a target during wars. There was a very famous battle fought there at the end of the war of 1812. That was when the British, once again, tried to get back the American colonies. That battle is appropriately named, “The Battle Of New Orleans” and it was fought early in 1815. The French Canadian, European and Indian residents, led by Colonel Andrew Jackson, united to defeat the British. Jackson was later to become our 9th President and his picture is still on every $20 bill. The ironic thing about this battle was that the war with the British was already over, but communication was so bad neither side had heard the news yet. New Orleans has had a lot of other disasters. Thousands died in the mid-1800s because of a yellow fever epidemic that was spread by mosquitoes. Apparently they had lots of mosquitoes due to the delta swamp lands. Other hurricanes have devastated the city. Yet, the cultural diversity of New Orleans has been fascinating and beguiling. There’s always been a charm about it. The city has the following interesting distinction. It is the city in the United States, that has more native born residents, percentage wise, than any other city. Look around us here. How many of us were actually born in San Francisco, (Rev. Tony counts.) One. Two.... Three. There’s a few but its only a handful. But New Orleans has more native born people than any other city. People who live there love it there. Well, there might be other reasons for that. It’s a poor city, and when you’re poor you can’t move away. You don’t have the resources to move away. About a quarter of the people of New Orleans, 25%, live below the poverty line. Still, people who live there love it there and many families have lived there for many, many generations. It receives ten million visitors a year. Ten million – that’s a lot of visitors. The pre-lent festival of Mardi Gras, generates billions of dollars for New Orleans. Mardi Gras literally means “Fat Tuesday”, the traditional day of indulging before Lent starts on Ash Wednesday. I anticipate there’s going to be a Mardi Gras next year too, that’s going to be very interesting because the city will still be piecing itself together. I bet there still will be a party there and it will be awesome! It will be a city in resurrection. Sounds like some interesting energy to be around. New Orleans has its own cuisine. Gumbo came from New Orleans. “Gumbo” is another word for the vegetable okra, and the dish gumbo is a stew made with chicken and shellfish and thickened with the vegetable okra which has a natural thickening agent in it. Gumbo is usually served over fresh rice. Jambalaya also comes from New Orleans. It’s another kind of stew dish with chicken, shellfish, spicy sausage and vegetables but this time cooked with the rice instead of served over it. Music is big in New Orleans. Jazz, of course, is synonymous with New Orleans. Many jazz greats have called New Orleans home: BB King, Louis Armstrong, Fats Domino, the Neville Brothers .... The French Quarter is a neighborhood known for it’s jazz clubs. If you’ve ever been to the French Quarter, to Bourbon Street, you’ve seen it. If not, it might be a little different than you’d expect. The jazz clubs are all very tiny. The musicians are only about ten feet away from the doors. The windows are open because its usually warm. The doors are open and you can hear the music everywhere. In the French Quarter they allow you to drink alcohol out on the streets. You can buy a drink from a bar by practically sticking your head in the window. They’ll give it to you in a plastic cup and you can wander out on the street again. There were even automated places to buy drinks right on the street where one could just walk up, feed in some bills and get a drink to go. Kind of like an ATM for booze. Which is why the streets always smell like stale beer, piss, and vomit. (laughter) It was one thing I didn’t like about New Orleans. It had a disgusting stench to it. A half of a million people lived in New Orleans and, as I said, about 25% lived in poverty. 66% of the population is of African American decent. Crime is high in New Orleans. The murder rate is ten times the national average. Last year, as a test, policemen fired 700 blanks in one neighborhood to test the reaction. Not one person called the police to report gun shots. So, who manifested Katrina? Well, I did. I told a lot of people what I didn’t like about New Orleans. It reminded me of a bad fraternity party. It was hot; the streets stank. It smelled like human excrement. That was interesting this week because I heard the same complaint all the time as they interviewed the survivors especially the ones who were stuck in the Superdome. There was human excrement all around. People were wading through water with human excrement. It smelled awful. That had been some of my recurring thoughts about New Orleans for several years. I created this. I did create this tragedy. It’s a human tragedy, and in truth, what’s really called for is tremendous compassion. What else could it illicit? The only natural response is to have compassion, especially for the people who are caught in it. I was talking to a friend of mine in the medical profession and she told me that the number of Post Traumatic Stress Disorders that are going to emerge because of what’s gone on there, in that city, will be colossal. I do believe New Orleans will rebuild and it will be bigger and more beautiful than ever. I think they are truly going to seize the day and make an incredible city out of this. In fact, if you’re in the trades – if you’re a plumber, a carpenter, an electrician – move to New Orleans because you’re going to have lots of work. You’re going to have a lot of work for the next several years. I don’t blame God for these things. They are not natural disasters, they are “unnatural disasters.” All disasters are unnatural. Hurricanes, earthquakes, tsunamis – they are like a sickness in the body of the earth. We A Course In Miracles students have begun to embrace the idea that sickness – AIDS, cancer, heart disease – is not natural in the body. We think our natural state is perfect health. If someone dies of one of these diseases the world usually says he died “of natural causes.” It’s not natural. It’s unnatural. These things that go on in the planet, I don’t think they are necessarily natural either. The living body of the earth, that manifests from our own consciousness, has diseases and problems like the human body does. As we truly heal and turn this world into the “real world” that reflects heaven I believe these things won’t be in it. That’s my personal belief. This is what I am learning from A Course In Miracles. Okay, why hurricanes? Well, I think we have a pernicious habit of spinning, really fast, disastrous ego thoughts. Think about it. We get hooked into certain things and we spin it and spin it. Then, we sit in the eye of it all and think that it all makes sense but just outside is this terrible destructive whirlwind. It manifests in the world. I think we’ve been spinning in the disastrous, destructive whirlwind thoughts of terrorism for a number of years now and I think it’s had a devastating effect. It caused them to eliminate 35% to 40% of the parking places in our airport parking garage. My peace is shot every time I go there. I can’t find parking anymore. It certainly is not helping me any. It caused them to move the security forward. Our relationships suffer. We can’t have nice “good-byes.” Is this good? Here is another good effect. When we hear about “natural disasters” happening in other countries – like when the tsunami happened in the Pacific / Indian Oceans at the end of last year – we read in the newspapers about the chaos happening in the streets and when there’s looting we get smug in this country. “Oh, that’s because they’re backwards people. That would never happen here in the United States! Not here.” Well, “Yes, here.” It did happen here. We’re not so different than anybody else. I think it’s been a very humbling experience for our society, for this country, to really see that we’re no better or worse than any people anywhere. We’re not more evolved. We’re all just people and we’re coping. When terrible things happen that stress people, people do things they shouldn’t do. I do think that arrogance is crumbling and I think it’s important for us to be humbled. Maybe everybody participated, metaphysically, in this event in order to teach us that lesson in humility. We should thank them. We’re not asking the right questions. What are we defending against? We think we’re defending against these terrorists but the problems are in our minds and we’ve spent four years now spinning around the destructive hurricane of thought about this external problem. But, nothing gets solved and disasters still happen. I can’t have breakfast with my sister at the airport and I’m safer because of that? I don’t think so. This article appeared in the August 2005 (Vol. 19 No. 6) issue of Miracles Monthly . Miracles Monthly is published by Community Miracles Center in San Francisco, CA. CMC is supported solely by people just like you who: become CMC Supporting Members, Give Donations and Purchase Books and Products through us.